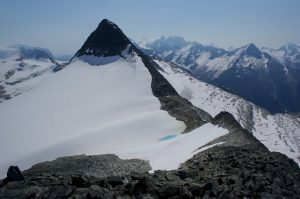 Asulkan Ridge is a line of lesser peaks between the Bonney and Sir Donald groups. Though it is long with a 5.4 crux, much of it is easy class 2 “exposed sidewalk.” Combined with easy access via the Abbott and Asulkan Hut Trails, this makes it a popular route, and an enjoyable moderate day. 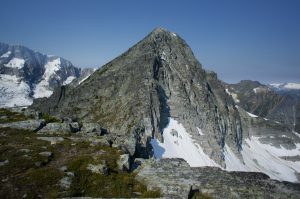 Though it is rated the same as Sir Donald’s northwest ridge, it is a good, easier alternative in the Rogers Pass area. The sun rises late in the deep, narrow valley of Rogers Pass, so I got a bit of a late start up the trail to Abbott Ridge. The trail passes underwhelming Marion Lake, then continues past the Abbott Hut before officially ending just short of Mount Abbott. There are two trail above the lake, amusingly labeled the “shorter way” and “longer way,” as if any sane person would choose the latter. 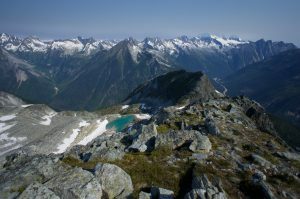 Beyond the end, a clear use trail leads along the sometimes-exposed ridge to Abbott’s summit, reached by a bit of scrambling. On the climb, I had seen two people summiting Afton, and from the summit, I saw them making their way along the long, gentle ridge to the Rampart. Afton’s east ridge looks steep, but the rock is solid with lots of positive holds. I mostly stayed on the ridge, occasionally straying left, and with a few low 5th class moves in a chimney, I emerged on the summit. Establishing a pattern that would mostly hold for the rest of the ridge, the descent was much easier than the climb, a boulder-hop down to a snowfield. It was warm, and I had a lot of ridge to go, so I preemptively supplemented my water with some slush. 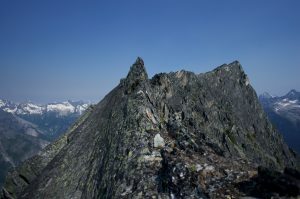 The ridge was mostly “exposed sidewalk” or easy walking on the west side, mixed with bits of scrambling to regain the crest or surmount steps. Just before the summit, I passed a young Asian couple with lots of gear — including mountain boots! — moving slowly and roped up. They caught back up as I had a sandwich on the summit, and we talked for a few minutes. They seemed impressed that I was soloing the ridge, and I encouraged them to lighten their loads on future outings. I passed a couple of taciturn Canadians on the boulder-hop toward the Dome, which contains the ridge’s crux. There are a couple large steps before the Dome, bypassed to the right, and I found the ridge’s only rotten rock on one of them. The guidebook mentions climbing a 5.4 crack left of the ridge. I climbed a chimney that looked about right, only to find a tat-nest above another chimney 10 feet farther left. Whatever — either way looks pretty tame. With a bit more scrambling and easy ridge-walking, I was on the summit. 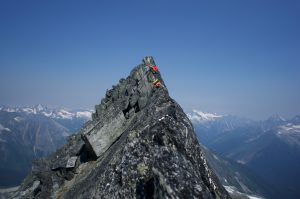 The Dome has a bit more fun in store on its south ridge, a long knife-edge that can be done as a hand traverse or a cheval. It can also be bypassed on easier ground to the right, but where is the fun in that? I met two guys contemplating the bypass, and encouraged them to take the sporting way. Beyond, the ridge becomes a boulder-hop down to the small Sapphire Col hut, where I topped up my water at a small ice lake on the edge of the Asulkan Glacier. From the col, Mount Jupiter’s three summits, the high point of the traverse, are all easy boulder-hopping. 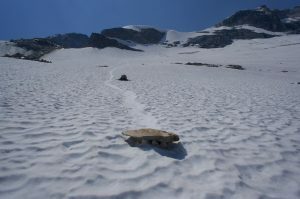 Beyond, I scrambled down some talus, crossed a snowfield, then fought a bit of unpleasant morainal garbage, looking for a low-angle and low-crevasse way down the Asulkan Glacier to the hut and trail. I crossed a bit of glacier then, instead of going over an unnamed bump along the ridge to Asulkan Pass, descended a chossy ridge splitting two lobes of the upper glacier. 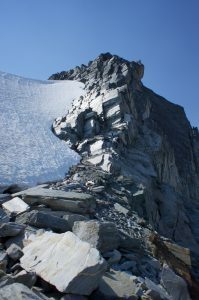 The final transition to the flat lower glacier proved to be the day’s crux, with a bit of desperate, careful scrabbling down a steep dirt-slope. There is probably a better way to do this. Do you see many grizzly in the north country? Bear spray? Is it smell that drives the bear in another direction? My funniest bear encounter was a bear hopping from car top to car top in a Mt Whitney parking lot. Who is going to tell him not to? I usually seem to see one about once a season, always from the car. For all that people wander around with bells on their packs, I think actual grizzly encounters are quite rare, and threatening ones even rarer. Bear spray is a strong pepper spray that, I guess, convinces the bear that humans are some kind of “super-skunk.” It is supposed to be more effective than a gun, since a non-fatal shot will just make the bear angry. I haven’t had the chance to try it on a real bear, though I’ve been tempted to test it on some people’s dogs while out running.